In the recent times, the word DENTAL IMPLANT has become a colloquial term when someone loses their teeth. But the correct information, relieving anxiety or clarifying doubts about the dental implant has not been made clear among the people. We, the experts at PS DENTAL CENTRE are here to help you out in delivering the best solutions & also rendering the best treatment with the trending dental implants!! Maybe you've heard people talk about dental implants. It's been said that they're modern dentistry's best option for replacing missing teeth; they offer the highest success rate of any tooth replacement procedure. With a proper care, they can last just as long as your own natural teeth — a lifetime. But, you may still be wondering: What exactly are dental implants? We're glad you asked! A tooth has two main parts: Thecrown (the pearly-white part that shows up when you smile), and the root, the part below the gum line that anchors the tooth in the jaw. A dental implant replicates the natural tooth . The titanium screw permanently replaces the root part of the tooth which is placed in the jawbone and with a crown (cap) that's created to look and function just like your natural teeth — is then placed on top of the implant. Together, they make an implant a complete tooth replacement system. What's so great about this system? It is the fact that the titanium metal of which the implant is made has a very special “osseo-integration” (integration with the bone) property. That's what is essential for an implant to stay in its place properly, to look good and to function well for a long, long time. . And isn't that what everyone wants from their teeth? Now you have read about dental implants. But, what is it actually like to go through the surgery since the implant has a screw shape? Seems to be what gives some people a pause; having a screw put into bone sounds like it would be painful; the reality is quite the contrary. During your first appointment, your dentist will consult you, examine your oral cavity, clarify your doubts, explain you about the treatment, X-rays will be taken for the assessment of bone. On this day, your dental implant treatment begins with a small surgical procedure under local anesthesia. Your dentist will open your gum tissue to expose the underlying bone, followed by which the TITANIUM IMPLANT placed & it is sutured. After the 7th day of surgery your sutures are removed. After your dental implant is fused with your jaw bone which will take approx.3 to 6 months. During this healing period a provisional crown will be given incase of front teeth. 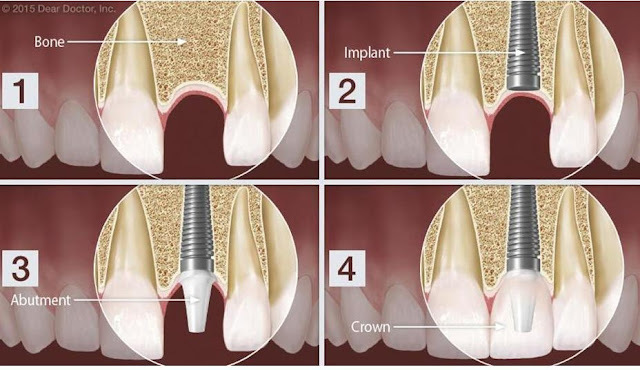 After the healing period, your dentist will attach the implant to a small connector called an abutment, which is going to hold your crown/bridge. Your dentist then makes impression & shade selection for your new tooth. The last step is to fix your new crown/bridge into the abutment. Ø Dental implant has a success rate of 95-98%. Ø They provide a long-term result & lasts lifetime when maintained properly. Ø It preserves the underlying bone structures. Ø Dental implants can be used for single or multiple tooth replacements, or as a means of supporting overdentures. Ø It does not require support from your adjacent teeth or any alterations to your adjacent teeth. Ø It does not require special care apart from brushing & flossing. Ø There are no dietary restrictions. Ø There is no risk of slippage while eating or speaking. WHY YOU SHOULDN’T BE NERVOUS ABOUT IMPLANT SURGERY ? 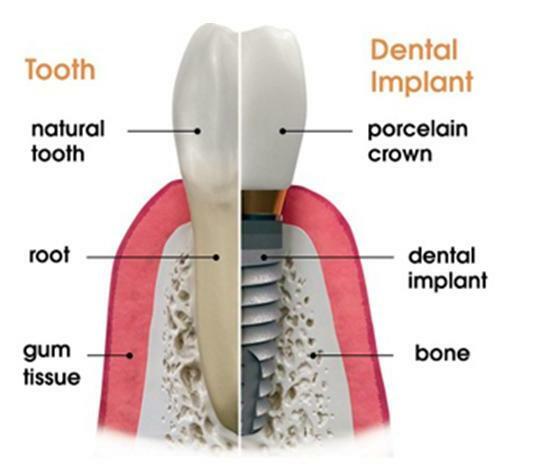 Dental implant surgery is a routine dental procedure in our PS dental centre. Since we have well trained experts, there is very little discomfort & a very high success rate. The titanium implant which is placed into your bone is a bio-compatible material, meaning it is non-toxic & it is not rejected by your body. We plan the procedure precisely. Implant placement details are often mapped out ahead of time. All the necessary pre surgical planning is done with the help of X-rays & CT images for placing an incision & creating a channel to hold the implant at the proper place . As you can see nothing is left for chance in the hands of an experienced and qualified team. Implant surgery can be performed with local anesthesia . Implantation is usually easier than tooth extraction. With a local anesthetic, only the implant site and surrounding tissues will become numb while you remain conscious. If, however, you have any anxiety can also ask our expert consultants about implant surgery under sedation or sleep dentistry before proceeding. The implant site heals fairly quickly and predictably with a 95-97% success rate. A few weeks after bone integration you will receive the crown and you’ll be ready for many years of full function and a confident smile. God gives you teeth twice. We at PS DENTAL CENTRE with our personalized care give you the third time. If you would like more information on dental implants, walk in to PS dental centre for an expert consultation.